Today's Kalmar Nyckel under full sail. You have just about another week to get out on the water aboard a remarkable tall ship, the Kalmar Nyckel. This ship is a recreation of the 141 foot full-rigged Dutch pinnace built in 1625. 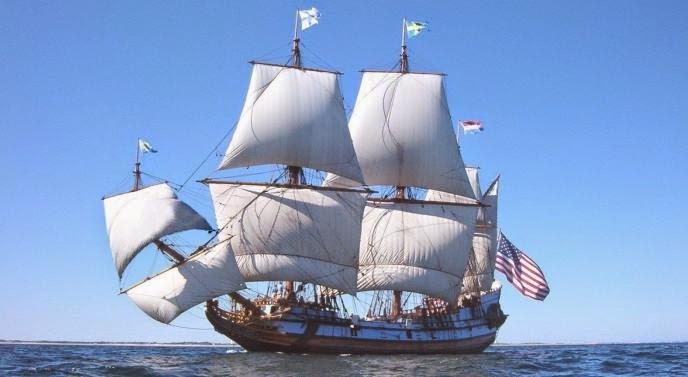 The city of Kalmar, Sweden, purchased the ship in 1628 as its contribution to the Royal Swedish Navy, and when the Swedish government decided to establish a trading colony in the New World, the Kalmar Nyckel was chosen to make the voyage, arriving in the area we know today as Wilmington, Deleware, in 1638. Fort Christina was built and a trading colony was established under the leadership of Peter Minuit. This recreation of that historic ship was launched in 1997, and it now visits Provincetown for a couple of weeks each summer as it sails along the eastern seaboard visiting a number of ports before it returns home to Deleware in the autumn. Visit their website at www.kalmarnyckel.org for more information on this remarkable ship and the colorful history of the original Kalmar Nyckel. While in Provincetown, this beautiful tall ship makes two sails daily (except Saturdays and Wednesdays) with a trip in the morning and one in the afternoon. The trip is about a three hour voyage around Provincetown Harbor, out into Cape Cod Bay, and out into the Atlantic Ocean. Passengers are invited to learn to listen for specific commands from the captain and to help to pull the ropes and raise the sails, if they'd care to. Many will try their hand at it, while other passengers are content to let others do all the work while they simply enjoy the trip. At the very least, you'll want to walk down to the far end of MacMillan Pier and have a good look at this splendid tall ship. Its quite impressive, and I highly recommend going for a sail. When will you get another chance to get out on the water on a tall ship?